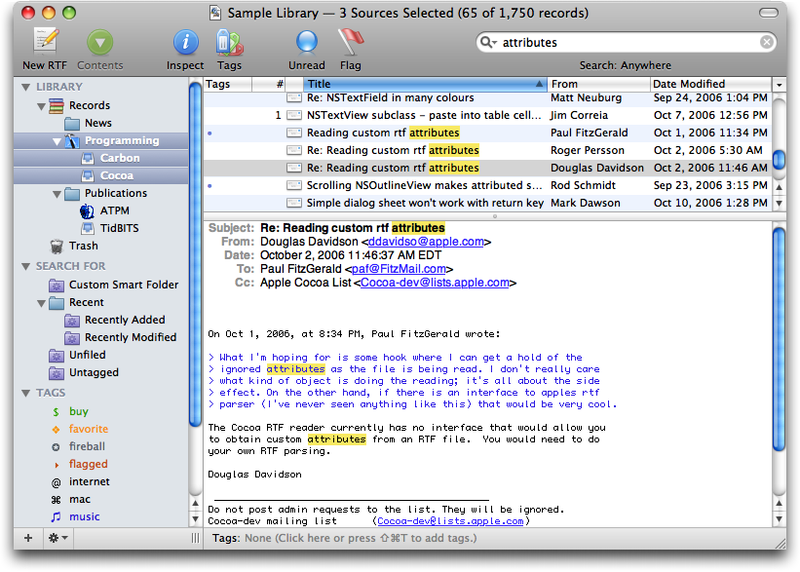 ...... EagleFiler for Mac is the most flexible tool on your Mac OS X. * Just press the F1 key to import a Web page, a scrap of text, mail messages, or any file on your Mac. Press Option-F1 for extra fun. * EagleFiler libraries use an open format: regular files and folders that are fully accessible to your other applications. * Import and view any kind of file: RTF, PDF, Word, images, Web archives, chats, and proprietary formats via Quick Look plug-ins. * The live search is faster than Spotlight, and you can also setup smart folders and smart folder actions. * Speed up your mail program by archiving old e-mails. EagleFiler can convert from Microsoft Outlook and other formats to the standard mbox format, and it's designed to handle tons of mail efficiently. * Save Web pages as self-contained Web archives or PDF files, including all the images, formatting, and the original source URL. Qweas is providing links to EagleFiler for Mac 1.5.4 as a courtesy, and makes no representations regarding EagleFiler for Mac or any other applications or any information related thereto. Any questions, complaints or claims regarding this application EagleFiler for Mac 1.5.4 must be directed to the appropriate software vendor. You may click the publisher link of EagleFiler for Mac on the top of this page to get more details about the vendor.